World premiere at the DOMOTEX World Trade Fair for Carpets and Floor Coverings in Hanover: between January 11 bis 14, 2019, Oerlikon Neumag will be showcasing its innovative new development, the BCF S8, to a wide audience for the very first time in Hall 11, Stand B36. Whether commodities or niche products – the new BCF S8 platform technology offers manufacturers of BCF carpet yarns decisive arguments for responding to constantly rising cost pressures and the trend for greater efficiency and quality in fiercely- competitive markets. World record: the system achieves never-seen-before spinning speeds and is able to simultaneously spin up to 700 filaments and produce fine titers of up to 2.5 dpf. This superlative performance is guaranteed by numerous individual innovations in the new platform and, for the first time, also in a new human-machine interface (HMI)-based control system, which opens the door to the digital age of smart carpet yarn manufacturing wide. At the ITMA ASIA 2018, the Oerlikon Manmade Fibers segment had already announced that it would be presenting revolutionary solutions in 2019 – both in hardware and software. And the DOMOTEX marks only the start. According to manufacturer information, the new BCF S8 is the most efficient Oerlikon Neumag BCF system of all times. “We have succeeded in achieving a new level of greater productivity and even broader product diversity. These allow our clientèle to better cater to changing market requirements and achieve a competitive edge in tough market conditions”, explains Martin Rademacher, Vice President Sales Oerlikon Neumag. As a pre-taste, the machine specialists from Neumünster are serving up performance figures and results from comprehensive trials conducted at their own BCF technology center as well as from two pilot systems which have been tried and tested within the market for months now. With up to 700 potential filaments per yarn end, the BCF S8 is raising the benchmark considerably compared to the Oerlikon Neumag S+ BCF system (400 filaments) that has dominated the global market to date. Oerlikon Neumag guarantees fine titers of up to 2.5 dpf. Furthermore, the process speed is higher than ever before – 3,700 m/min (winder speed). This permits throughputs of up to 15 percent greater compared to predecessor technologies. Overall, system efficiency is 99 percent – almost unbeatable. True to the Oerlikon Segments Manmade Fibers segment e-save philosophy, energy savings of up to 5 percent per kilogram of yarn are achievable. This comprehensive progress has been achieved with numerous smart innovations. To this end, one key element above all has been optimized. The yarn path from the spinning system to the new, large cooling drum has now been almost completely straightened. This yarn path, unique to the BCF market to date, ensures that the individual filaments are subjected to minimum friction, hence once again considerably reducing yarn breaks and optimizing the overall production process. Especially noteworthy here are the, for the first time, straight yarn inlet in the texturing head – guaranteeing superior yarn quality. And the considerably reduced distance between the heating godet duo and the texturing head also has a positive impact on the texturing process. It ensures a more even twist to the yarn and reduces the compressed air consumption. Furthermore, the texturing chambers can be removed individually, which additionally shortens servicing times. The now closed units also provide the best possible protection for the texturing jets and lamellar chambers. The 800-mm diameter cooling drum optimally and gently cools the filaments. And this has a positive influence on the yarn quality. The new cooling drum is now equipped with a V groove for all polymers (PET, PA6 and PP) as standard. The RoTac3 tangling unit, already established within the market, once again reduces the compressed air consumption by around 50%, while the newly-developed Witras III-37 winder achieves production process speeds of 3,700 m/min. 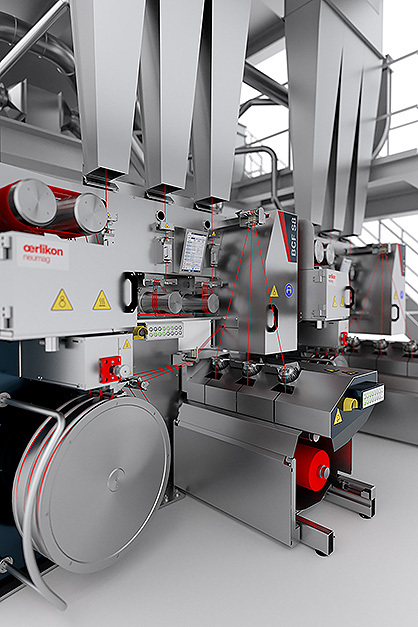 The new BCF S8 is the first Oerlikon Manmade Fibers segment system equipped with the innovative human-machine interface (HMI) for intelligent controlling and monitoring. In this case, the interface between man and machine has been oriented on the daily requirements of users in BCF production. With its new ‘look and feel’, it supports intuitive operation and offers direct access to important infor- mation as well as actual and target values at each take-up position by means of a touch screen. A completely new ‘alarm philosophy’ also simplifies troubleshooting and malfunction analysis. “This smart HMI system is a logical step in the digitalization of our products”, explains Dr. Friedrich Lennemann, Vice President R&D Oerlikon Neumag.